Girls Call The Shots: The Launch! Sitting with one of our teens, Michelle, as she edits. Sag-AFTRA: Thanks to Ruth Paul! We started as an idea. The idea had a following. We decided to test it out. We needed a tag line. And a shirt. Funding for this event is provided in part by the Broward County Board of County Commissioners as recommended by the Broward Cultural Council and Greater Fort Lauderdale Convention & Visitors Bureau. The Girls Call The Shots Movie in a Month project empowers teen girls to be leaders in film by immersing them in the production process of a short film from script to screen in four weeks. Like any good startup, we wanted to know if our project was even something teens needed. 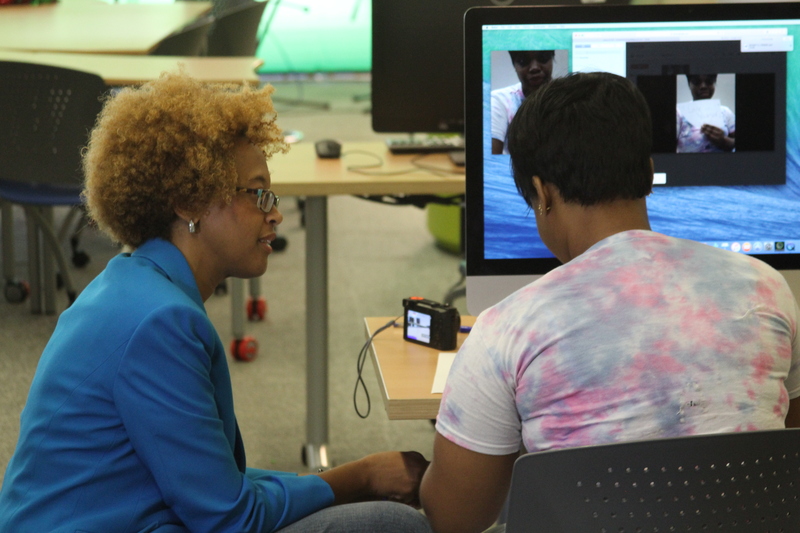 Summer 2016, we launched a teen film and media lab in collaboration with the Broward Library system and the Women of Color Empowerment Institute. We thank Sistrunk Soup community for providing us our first round of seed funding. We continued the work in summer 2017 with the support of the Broward Cultural Council. The teens came. They took buses. They dragged their parents and guardians. From a guardian’s Facebook post: “I heard for the next 45 minutes on the trip home about how ‘the camera never lies’, and ‘framing’ and how awesome it was.” Along the way, Professional Sound Services taught us about capturing sound, and a wonderful new mentor dropped in. Thanks to our partners and sponsors whose logos you can find in our gallery.